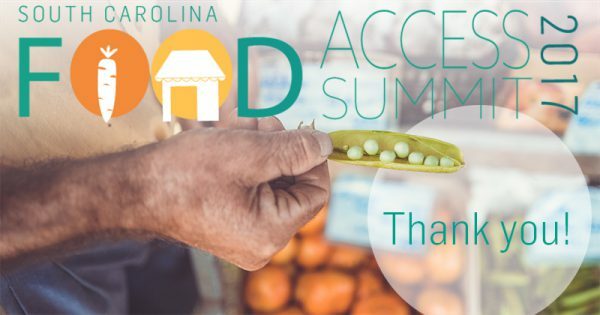 Thank you for joining us at the third annual South Carolina Food Access Summit! When you have a day as packed with great information and inspiration as this one was, it can be easy to miss a few things along the way. That’s why we’ve pulled together a few of our biggest takeaways and a few resources which were shared throughout the day. 1. People are motivated to take part in shaping food policy. Both Lauren Harper and Mayor Benjamin from the City of Columbia noted that the formation of the municipal food policy committee has more constituent interest than any other city commission in recent memory. That is encouraging news for cities hoping to follow in their footsteps. 2. Equitable food access is part of the City of Columbia’s vision for the future. Columbia Mayor Steve Benjamin shared in his keynote address to the summit that ensuring access to healthy foods for all residents is included in their vision for this city. We can take that vision to all of SC’s cities and towns as we work to shape our local food systems. 3. We heard the call for a centralized place for food access information. That’s why we want to remind you about the SC Food Access Task Force website. We also aim for the Food Access Newsletter to be a resource for you to learn more about healthy food news and events happening around the state. You can sign up for it here, and you can supply content for it as well! Just send your submission via this online form. 4. Exciting work is already happening across the state. 5. You are the experts on your communities! We spent the afternoon in regional breakout sessions facilitated by Community Food Strategies (learn more here) and one thing was clear: you know your communities, the challenges they face, and you’re engaged in the work to create more equitable food access. Thank you for spending the day with us. We hope you’re feeling energized and inspired and ready to shape food policy and the food systems in your home towns.